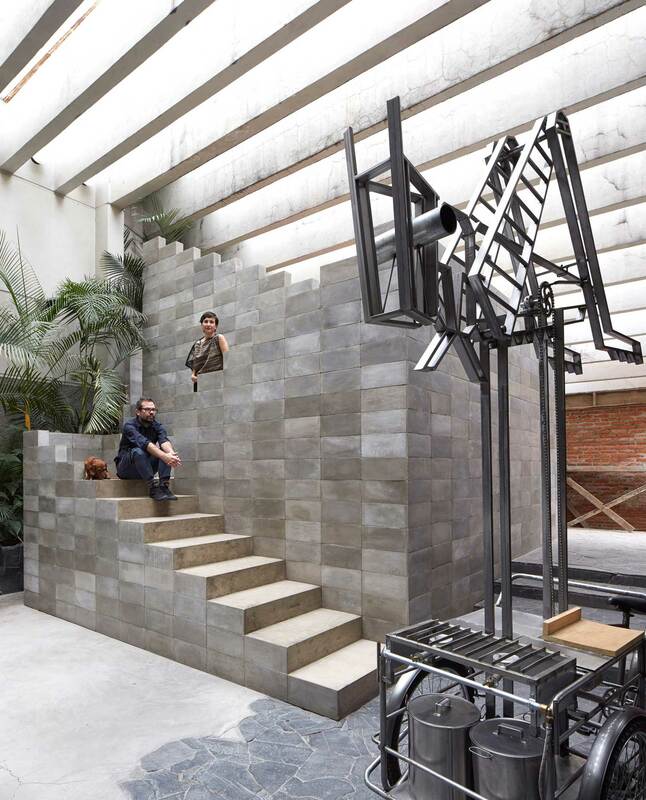 Brutalist Home & Studio of Mexican Sculptor Pedro Reyes & Carla Fernandez. 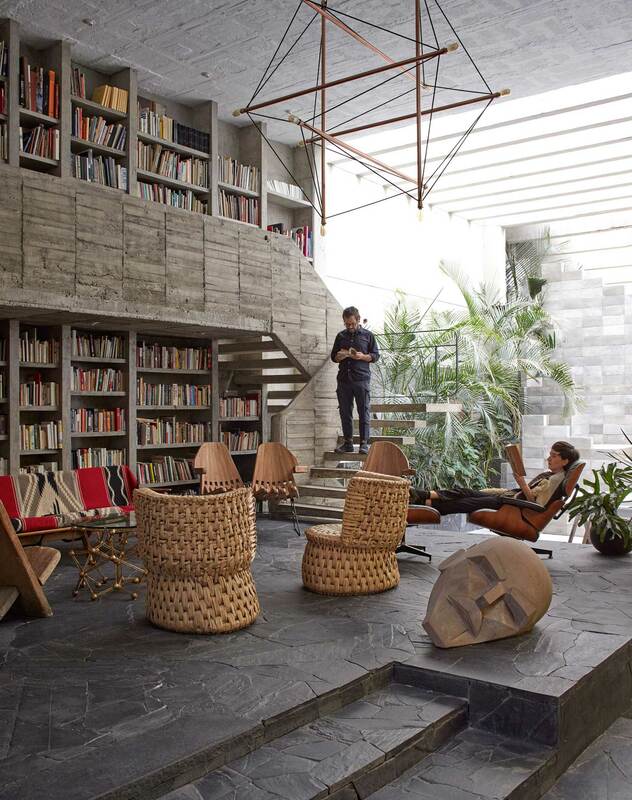 A melange of concrete textures makes up this Mexico City home of artist and his fashion-designer wife . 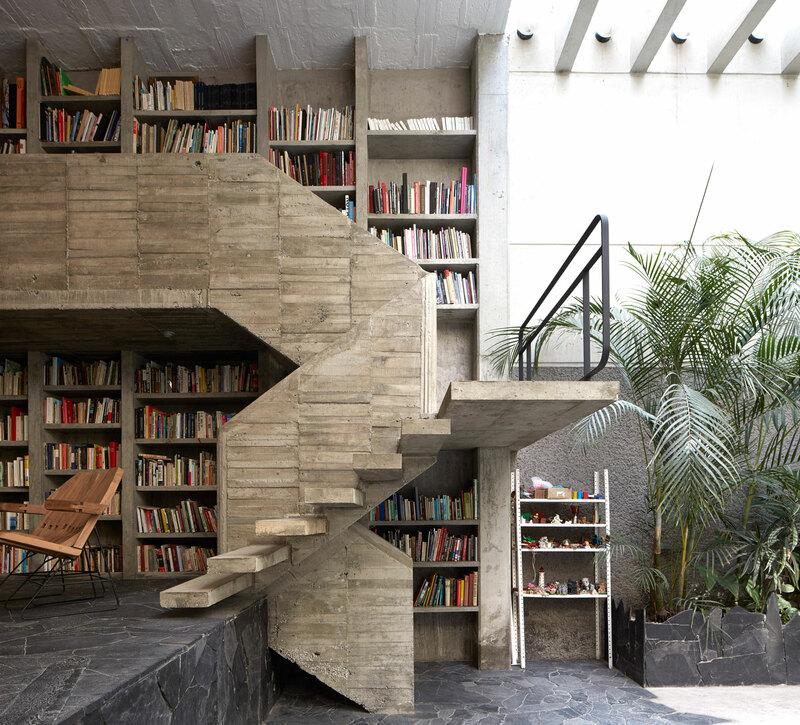 Bold, brutalist and Barragán-inspired, this banger of a building features whacky paving floors, an expansive double height library and cement blocks made by local craftsmen. 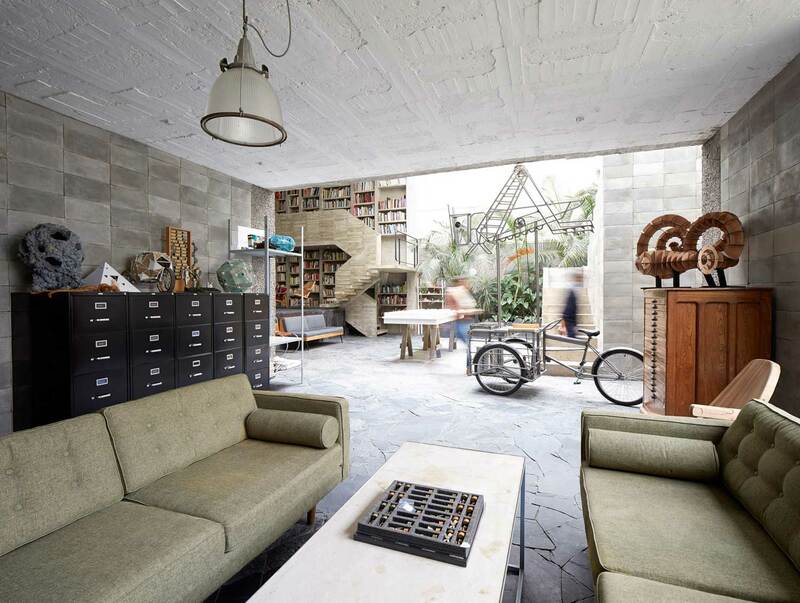 The house is located in Coyoacán, an up and coming area in the south of Mexico City which was once home to famed Mexican artist Frida Kahlo. In fact, comparisons have been made between Reyes and Fernández and Diego Rivera and Frida Kahlo with their lives dedicated to their craft and their home open to other artists for residencies and exhibitions. Prior to becoming an artist, Reyes trained as an architect and had aspirations to convert their home from a “1980s monstrosity with an indoor pool and various eccentricities” into a contemporary space that “includes hints of all of Mexico’s many modernities.” Reyes and Fernandez are fiercely passionate about the preservation of Mexican culture and this is clear through the architecture, art and furnishings of their home. 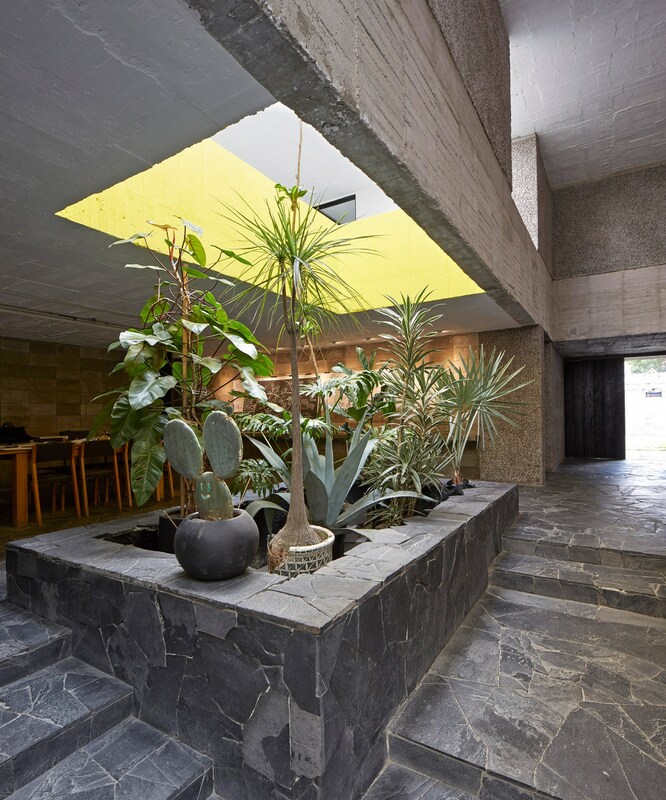 Hammered concrete floors and walls were inspired by the Mexican brutalists, in particular Teodoro González de León, a significant architect in the region. As an ode to Pritzker Prize architect , the couple incorporated unexpected pops of magenta and yellow amongst a palette of mostly subdued greys. 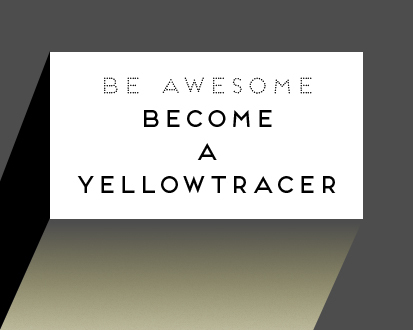 Oh guys, this gets me so good. Not only is the intensity of colour so moving but it’s also an incredible testament of the country’s vibrant artistic history and traditions. 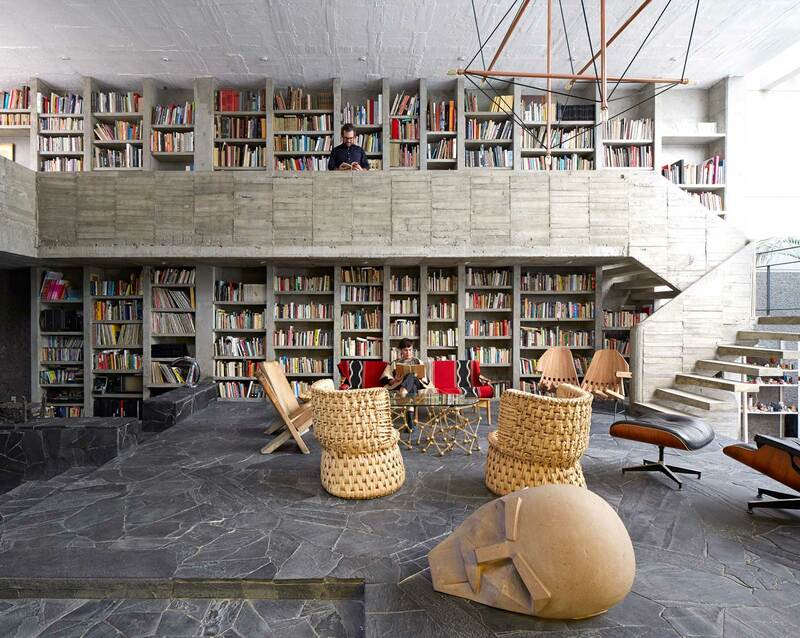 Within the double-height living space is a huge bookcase made from slabs of concrete while cantilevering steps lead up to a narrow gallery overlooking the lounge. A ceiling light over this space is constructed out of copper tubes and is inspired by . Upstairs there is a master bedroom, two bedrooms for their children and a family bathroom. 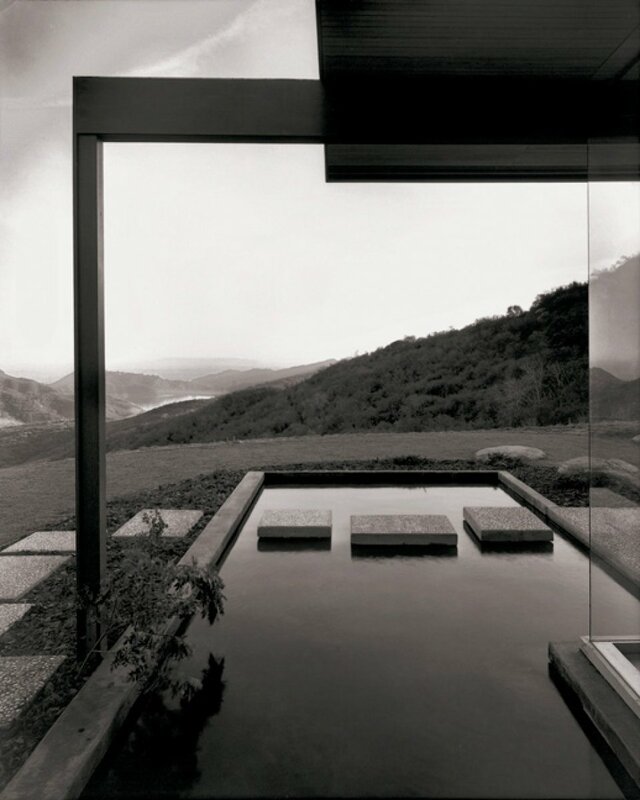 Concrete is not limited to the structure, walls and floors but also permeates into joinery and furniture. In the kitchen for example, you would think that the entire thing made from concrete would run the risk of conjuring caveman imagery but the result is surprisingly refined and fun…and at the very least inspires a very cool Flinstones vibe. 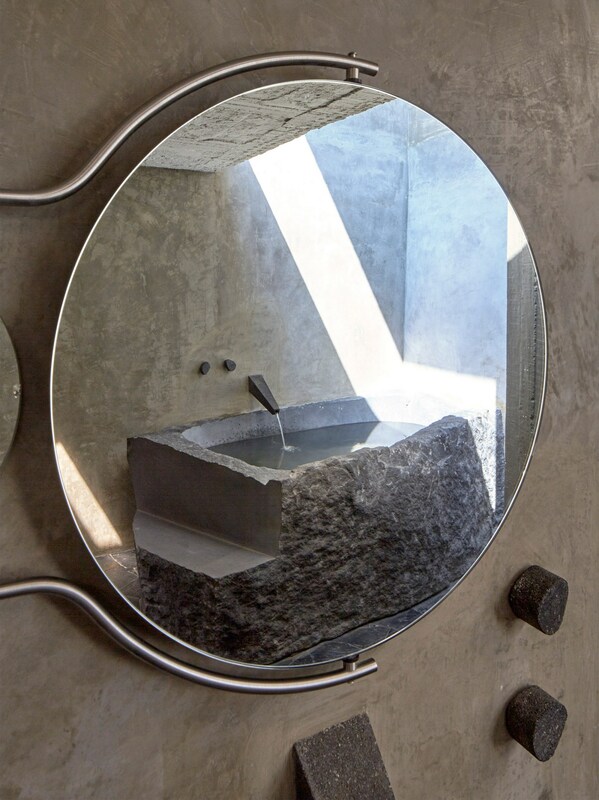 In the bathroom, a bathtub is roughly cut from lava stone while the sink and vanity are moulded into one fluid form. 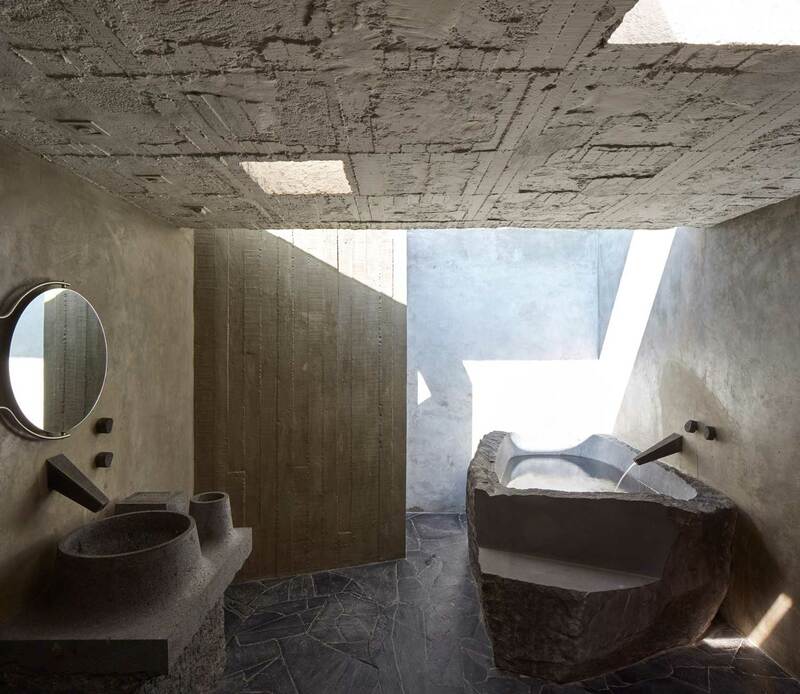 Take note of the custom concrete tapware… ooof! At the heart of it, this house is a gathering place and a hive for creativity. It’s a dynamic studio for the works of Reyes and Ferdinand and a place for people to come together. “It’s a social space,” says Reyes, “we are always welcoming guests or hosting the artisans on our teams.” A playground of sorts, this house is lovingly handcrafted and showcases very humble materials and amazing Mexican craftsmanship. Big call but it might just be my dream home! 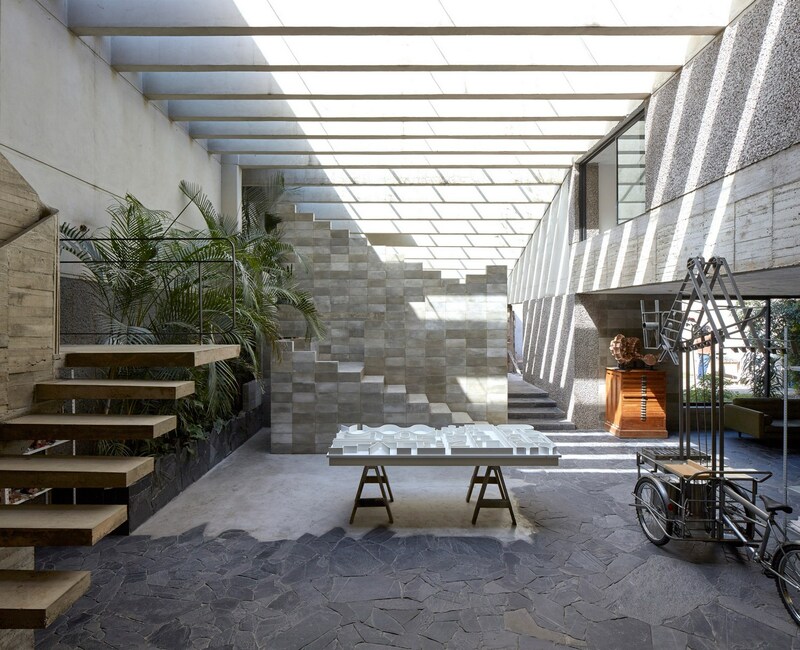 Happier Café: Paper Space in Taiwan by JC Architecture. Redfern Terrace by Kirsten Stanisich of SJB Interiors. Architecting away in Melbourne, Fenina is a shameless fashion, art and design fanatic who loves defying the relentless Melbournian uniform of black on black on black. 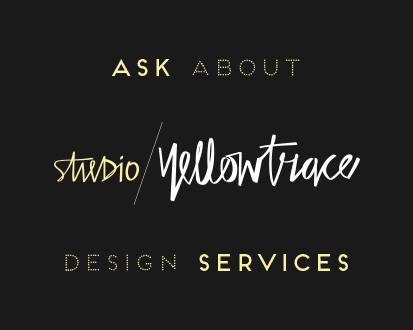 Often spotted strutting a boisterous mix of pattern and colour, her eclectic love for the bold, raw and textured fuels her passion for design and contemporary art. 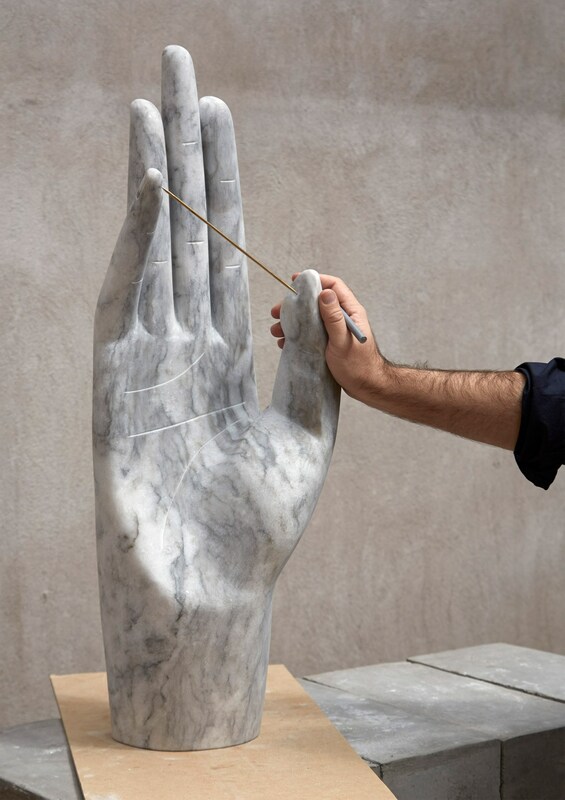 When not indulging in Cy Twombly’s sensitive scribbles or Serra’s evocative sculptural forms, her love for everything Italian consumes the rest of her time. Whether it’s the language, design or food (especially food), Fenina is obsessed!